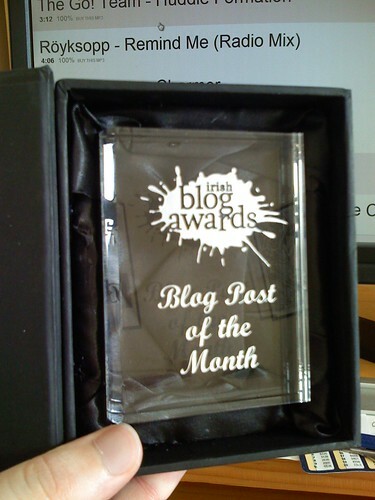 As a way of keeping interest going in the Blog Awards, there will be a “Blog Post of the Month” awarded to an Irish Blogger/Group of Bloggers who has/have written what the judges deem the best post that month. The judging criteria is totally arbitrary but we can reveal the use of star signs, tidal movements and a special breed of chicken. If you want to nominate a blog post, simply blog about it and link to it and this blog post or if you want to nominate the blog privately, fill out this form. Any blogger who campaigns to get nominations will be found out and will be removed from consideration. Nominate yourself if you think you’re worth it. 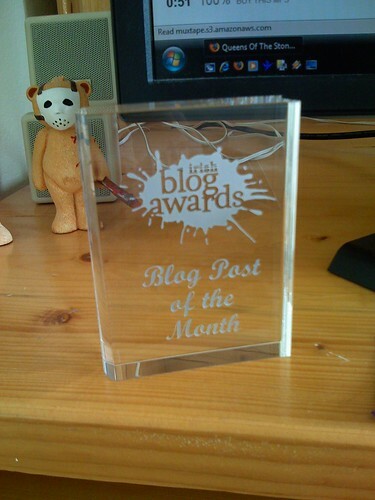 This entry was posted on Monday, May 12th, 2008 at 4:44 pm	and is filed under BlogAwards. You can follow any comments on this entry through the RSS 2.0 feed. Comments and pings are currently closed. Wow that is real cool! When do we start to nominate? Can we nominate a backdated post (written in ’08) or should it be one written in the same month as the award? @Steph The Award will be announced the first week of the following month e.g. The Best Blog Post for May will be announced the first week of June. We won’t go back further than April for the first Award. Given were almost halfway through May already nominations for the Best Blog Post for April will be accepted for the next week and then it’ll be announced. For all other months we’ll have the full month to send in nominations. Another great idea, and the award is cute too. Can I have that bear w/Jason Vorhees mask? So how do I get a nominate this for awards button? So in order to nominate someone’s post, we have to post about it in our own blog? “Theyâ€™ve not gone away” – I believe this is a particularly English saying. Just thought you might be interested in a cultural observation – good luck with the awards! I’m Irish. I said it. You’re wrong. Hooray! Grannymar » The Man Never Sleeps…. » If there was ever a candidate for Blog Post of the Month… ellybabes: Mad ramblings whenever I feel like it….